This past summer during the World Cup viewers learned a lot about the political troubles of Brazil and how the World Cup helped unite the nation to some extent during the games. A conflict we do not hear much about in America is that of Belgium: specifically the French and Dutch speaking sections of the country. For the most part, the South of Belgium speaks French, while the North, including the tourist cities of Ghent and Bruges, speak Dutch . Brussels, lying in the center of the country, is relatively bi-lingual, although from my experiences, English, Dutch, or French will suffice in most areas of the capital. However, this divide is much more serious than just a language. These two sides have a different national identity. While this following story is anecdotal and extremist, I feel like it portrays the magnitude of the conflict. A French co-worker of mine was rear ended in Flanders. The drivers pulled over and when she started speaking French to the other driver, he punched her and threw her against his car, breaking her wrist in the process, all because he thought it was disrespectful of her to speak French in Flanders. In a recent European Union study, Belgium was one of the least patriotic countries of Western Europe. After the 2007 election, Belgium did not have a government as there was a six month government shutdown, and an 18 month shutdown occurred again in 2010. In 2010, Vlaams Belang, a Flemist Nationalist Member of Parliament, yelled out “Long live free Flanders, Belgium may die!” This sentiment was echoed by Willy De Waele, the mayor of Lennik, a small Flemish town, who stated “I’m Flemish, not Belgian. There’s no loyalty to a country called Belgium” . 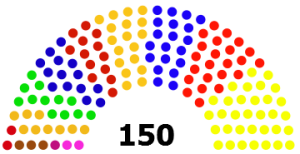 Currently, the Flemist National Party is currently the largest party in the Belgium Parliament, which leaves some to be worried about the future health and utility of the country . 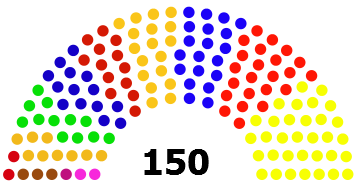 In the following photo, the yellow seats on the right each represent a member of the Flemish National Party, which is currently in the coalition that is in power in the Belgian Parliament. Before Belgium’s matchup with the USA in the Round of 16, Belgian Head Coach Marc Wilmots stated “I don’t understand. Is there a war in Belgium?” when asked about how his team deals with the differences between the Flemish and Wallonia (the French speaking South) members. However, there has been political pressure for the Belgian National Team to select as many French speaking members as Dutch speaking members for their World Cup and European Championship squads . The Belgian team is relatively diverse in terms of Northern and Southern Belgian members, for example, Eden Hazard is from the French speaking South (La Louviere), while Thibaut Courtois is from the Dutch speaking North (Bree) and Marouane Fellaini is from Brussels . Clearly, there is no Flanders in FIFA (although some are petitioning for Flanders to have their own independent soccer team), and therefore players from the Flanders region such as Courtois and Lukaku must play for Belgium. However, ever since the 2008 Olympics where the Belgians placed 4th in the men’s soccer competition, and the rise of the Belgian Golden Generation, Belgians have seen the team as much more Belgian and focus much less on the regional makeup of the team . This past World Cup was Belgium’s first since 2002, and unified support of the soccer team across the country was something that had not been seen in a long time. From my experiences in the country this summer, Belgian flags were waving off balconies through Brussels, but also in the Flemish tourist towns. While watching the games in Grand Place and Good Kompany in Brussels, I remember listening to Belgians in front of me from Ghent still supporting the Belgian team, despite their pro-Flemish views and political differences (thanks to some translation help from a different co-worker). The experience in Brussels during Belgium games was incredible as it seemed like the whole city would be out on the streets and fireworks would be set off. The Belgians seemed happy (until Argentina defeated them and they had to work the next day) and it hardly seemed like a country that was going through so many political troubles. As we have discussed in class and through our readings, that is the beauty of sport. Johan Vande Lanotte, a Flemish socialist, stated that the World Cup has helped bring Belgium together and given minorities and immigrants more respect in the country. “We can vote one week for a party that wants to split the country, and another week we can wave the Belgian flag for the football team,”Lanotte stated. “Yes, it is strange, but then we were the inventors of surrealism” . Others, such as an IT consultant from Ghent praised how the Belgian squad worked together as a unified team. One can only hope that Belgians off the pitch will work together to settle their differences as well. Super interesting blog! I am curious about the aftermath of the World Cup, and how Belgians approached national unity directly after it. For example, did the unity during the world cup spark national debate about nationalism in the future? And if not, how can Belgian Football introduce this debate in the future? Also, I am wondering about where immigrants fit into this debate. Sure, immigrants and minorities are given more respect during the World Cup, but what about directly after the World Cup? These are really interesting and well-contextualized reflections, Dylan! I think the presence of children of immigrants on the team is a particularly important piece of this (I wrote about this in a piece for Roads & Kingdoms/ Sports Illustrated last year: http://roadsandkingdoms.com/2014/afro-europe-in-the-world-cup/) as well as the ways the success of the Belgian team connects to a very solid state investment in football infrastructure and training (something I also wrote about for the New Republic: http://www.newrepublic.com/article/118535/world-cup-2014-effect-diaspora-usa-belgium. I hope you keep exploring these issues on Belgian football!